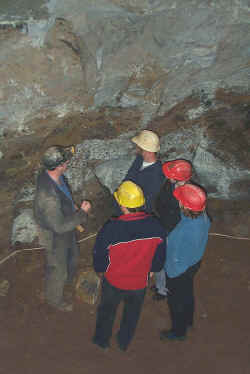 This information sheet gives information about safety and rescue arrangements in caving. Whilst the information has been compiled from advice given in caving and other publications, no responsibility can be taken for the accuracy of the information or for the consequences of following this advice. TAKE FULL RESPONSIBILITY FOR YOUR OWN ACTIONS. All parties should be properly organised, equipped, and supervised by a responsible and experienced leader. Pick a cave or mine well known to the leader and within everyone's capabilities. Take notice of the weather forecast before going down caves where water flows. Ask for permission to enter sites on private land, and securely replace gates, grills, and shaft cappings. If you are going to be coming out late on the Yorkshire fells, take a whistle, map and compass. No less than 3 in the party, and no more than 3 novices for each experienced leader makes sense. For Alderley Edge, do not exceed 7 visitors per leader. One helmet and reliable cap lamp for each person with spare batteries. Beware of disturbing stacked rock, loose boulders or props, especially in mines. Ensure that ropes, ladders, belays, etc are rigged properly before hanging your life on them. Someone should carry emergency lights, a couple of bivvy bags, food, water and first aid. Act sensibly - do not drop stones down mine shafts or cave pitches. Falls, loose boulders, flood water, exhaustion and being cold and wet cause most accidents - take care. Exit takes more effort than entry, especially on long trips-plan with the return in mind. You can download an aide memoire for the call out person HERE. Fill this in before the trip and leave it with you husband, wife, partner, parent or best friend. 1 Decide whether outside help is needed or not. It probably is - don't take chances. 2 To summon help, send competent persons to the surface with reliable information for passing to the authorities (see paragraph 5 below). 3 Administer First Aid. Bearing in mind the inevitable delay before rescuers arrive, encourage injured persons who are still mobile to start moving towards the surface. At all events, reassure and keep injured persons warm. 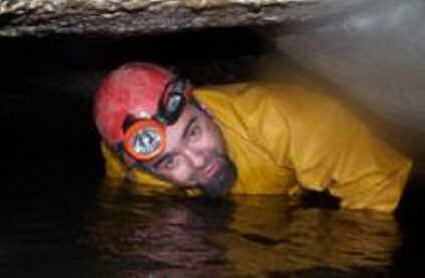 4 To call out the Cave Rescue Organisation telephone 999 and ask for Cave Rescue. Take care when using a mobile, it may not go to the local police. Identity of person telephoning and where calling from. Name of cave or mine and its location. Whereabouts in the cave or mine the accident occurred. Time and nature of accident and injuries sustained. Number of persons still underground at the scene. 6 The caller should be prepared to stay within reach of a phone to give any further information required. - ASSESS THE SITUATION - is there any danger to casualty or rescuer? 1. Remove obvious debris from the casualty's mouth. 2. Tilt the casualty's head back and lift his or her chin upwards. Check if the casualty is breathing by LOOKING, LISTENING AND FEELING for his or her breath for 10 seconds. Check the pulse in the casualty's neck for 5 seconds. 1. Pinch the soft part of the nose closed, using the index finger and thumb of your hand on the forehead. 2. Allow the mouth to open, but maintain chin lift. 3. Take a normal breath and place your lips around his mouth, making sure that you have a good seal. this is an effective rescue breath. 6. Give breaths at a rate of about 10 per minute. re-check ABC of Resuscitation and continue as appropriate. 8. Check for pulse after every 10 breaths. 9. Stop to recheck the victim only if he starts to wake up: to move, open eyes and to breathe normally. Otherwise, do not interrupt resuscitation. 10.When breathing restarts, place him or her in the Recovery Position. -- NOT BREATHING, NO PULSE ==> Dial 999 for medical help or send someone to do it for you. This page is not intended to give advice to untrained cavers on chest compression techniques. For a copy of this information on an A4 page as a PDF file, click HERE and download or print the file. 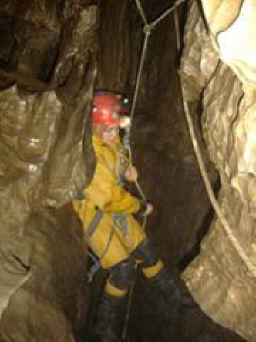 The website of the national British Cave Rescue Council. 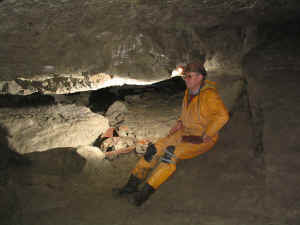 The website of the local Derbyshire Cave Rescue Organisation which covers the Alderley Edge mines as well as Derbyshire. Information about Suspension Trauma can be obtained from www.suspensiontrauma.info. Downloadable advice and training from the St. John Ambulance. First Aid information from the Ramblers Association which contains some practical tips.